We all have had those awful days when we have lost our important receipts, worse is the situation when have to produce those receipts to someone at workplace for compensation. 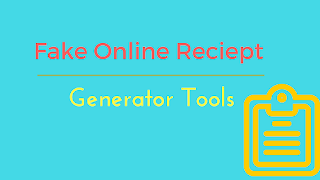 Or you have lost your receipts and don’t have the time and skills to make one by yourself you are lucky to read this article, because today we will discuss about the online receipt generators. 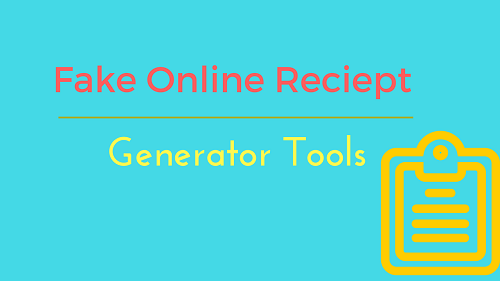 When it comes to making your own custom receipts online receipts generators are the best to do so. These are some of the offerings by express expense. But after you have entered your details for the receipt, they will generate the receipt according to your details but with their express expense watermark. And to remove that watermark you will have to pay a fee. But it will save you from a very difficult situation. So the fees won’t be a big deal. Freereceipt.us : - The second app on our list is Freereceipt.us. this online tool allow us to make our own custom receipt as per our need. We just have to enter our required details and Freereceipt.us does the rest of the work for us by providing the receipt for us. Unlike express expense Freereceipt.us is totally free service.There are mainly three steps involved in the generation of fake reciept by this tool.The first step comprises of adding several information such as , store name, address, city, state, postal code,Seller slogan, Customer(name/number), cashier (name/number), payment method and return policy.The second step consist of adding Purchased items along with price and Finally click on Makereciept button. Makereceipts.com Online Gas Receipt Generator: - Makereceipts.com is a fake petrol Pump/Gas station receipt maker. Makereceipts.com is mainly for the residents of The United States and Canada as they will get ready made templates.Basically it has three main steps in it which are Calculate fuel details, Gas station details and Fuel purchase details.It is one of the best tool for users of Canada and US.You can easily create or update your fake receipt by just a simple click. 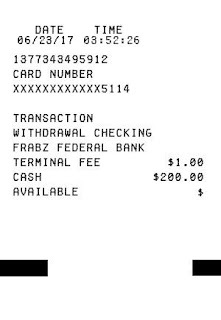 Fake ATM Receipt Generator : - This is the one online fake receipt app which has to be definitely on the list. Fake ATM receipt is made by Frabz. If you lost the ATM receipt accidently or if you want to prank your friends by showing a low balance in your account so that they will pay the bill, then this is the application you are looking for. I love this online tool very much because of its accuracy; it looks so real that it seems we just now got it from the ATM machine. Redoreceipt.com : - Last but not the least redo receipt surely finds its place on the list with its super easy to use features that even any new person using this application for the first time will be able to get benefit out of it within a few minutes. You can create sale receipts, custom receipts, fake invoice receipts to name a few. This service allows you to create free receipts in just a few clicks without any expense. I hope this article would have helped you in deciding which online fake receipt generator to use.